Calabasas Pumpkin Festival: Get into to spooky spirit with inflatable rides and giant slide, live bands, pumpkin pie eating contest, mummy wrap contest, pumpkin seed spitting contest, reptile and nature shows, carnival games, business vendors, car show, food and beer, jewelry and craft marketplace, kid zone with children’s craft projects, balloons and face painting. Saturday and Sunday, 10 a.m. – 5 p.m. Juan Bautista De Anza Park, 3701 Lost Hills Road, Calabasas $5, free parking and shuttles. 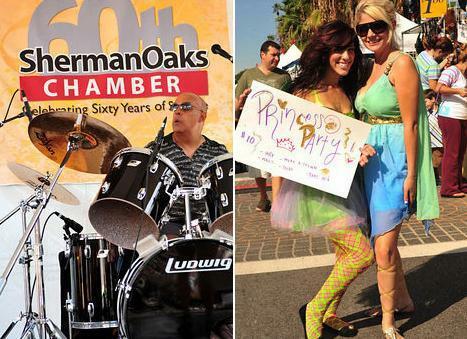 80, 000 people are expected to attend the Sherman Oaks Street Fair on Sunday. Dinosaur Train’s Buddy The Dinosaur at the L.A. Zoo. : “All aboard!” to the L.A. Zoo for PBS SoCal Day on Saturday and Sunday from 11 a.m. – 3 p.m. The popular PBS show, Dinosaur Train sends “Buddy the Dinosaur” to the Zoo for meet and greet opportunities. Guests can also enjoy activity tables, watch a short episode of Dinosaur Train at the Witherbee Auditorium and learn aboutthe similarities between dinosaurs and some of our Zoo residents. This event is free to GLAZA members and with paid Zoo admission. Jewish County Fair: It’s an outdoor community celebration with food, music and fun activities. Musical performances include Idan Raichel, Joshua Nelson, Josh Neslon, Michelle Citrin, Moshe Hecht, Yael Meyer, SoulAviv, Ari Herstand, Elana Jagoda, Saul Kaye, Iliana Rose, Robbo, and more. Carnival games and rides, bungee trampoline, moonbounces, hatchet throwing, outdoor cooking, nature crafts, arts and crafts, pita making, tree planting,”Jamba Jews” bike blender, zipline, nature hikes, dunk tank, face painting, ultimate GaGa tournament, animal education with The Reptile Family and more! Sunday, 11 a.m.-6 p.m. Sholem Institute 34342 Mulholland Highway, Malibu. For more info or to purchase tickets $6 advance/$9 at the door, visit www.jewishcountyfair.com. Yogaworks Pilates Free Class: Yogaworks is introducing their new Pilates Studio by offering free one hour pilates classes for one day only Saturday, 9 a.m. – 1 p.m., 18700 Ventura Blvd, 2nd Fl., Tarzana/Get free refreshments too! Space is limited and pre-registration is required. Call (818) 457-6900 to reserve a class time. Los Angeles Food & Wine Festival: Over 100 celebrity chefs, 300 wines and more than 70 events will be spread out from Santa Monica to Beverly Hills to Hollywood and Downtown all weekend long. There will be cooking demos, lunches, dinners and after-parties. The festival culminates with Wolfgang Puck’s brunch and charity auction on Oct. 16. See celebrity chefs such as Nancy Silverton, Sang Yoon, Tom Colicchio, Masaharu Marimoto, Hubert Keller and Daniel Boulud, and Josiah Citrin. Guy Fieri is even hosting a gourmet BBQ on the Santa Monica Pier. A portion of the proceeds will go to benefit the Los Angeles chapter of Meals on Wheels. Tickets can be purchased online. Beverly Hills Art Show – Affaire In The Gardens: Spanning four blocks, this free public art event on Saturday and Sunday from 10 a.m. to 5 p.m. features 250 artists from around the United States that will showcase an upscale, yet affordable, array of paintings, sculptures, photographs, and prints. The event features art tours, a dance performance, the artists’ award ceremony, in-booth artist demonstrations, special exhibit curated by Los Angeles Art Association, wine garden and delicious food. (Beverly Gardens) 241 North Canon Drive, Beverly Hills. Vintage Fashion Expo: The Santa Monica Civic Auditorium is the place this Saturday and Sunday to find vintage clothing, accessories and textiles. Over 85 dealers will be showing a wide range of periods (1850-1980) and price levels, every style imaginable, from belle epoque finery to bell bottom jeans, european classics from Chanel, Schiaparelli, and Lanvin, timeless American designs by Bill Blass, Bonnie Cashin, Halston & Claire McCardell and more. Early Buy Admission is $20. Regular Admission is $10 .Early Buy 9 a.m. -10:30 a.m. Regular Admission 10:30 a.m. – 6 p.m. Sun. Regular Admission 11 a.m.-5 p.m. FREE entrance on Sun. with Sat. ticket purchase. Students free on Sun. with student ID. The Harvest Festival® Original Art & Craft Show: It’s the largest indoor art & craft shows on the West Coast is happening today through Sunday in Ventura featuring hundreds of artisans exhibiting American handmade items including beautiful jewelry, clothing, specialty foods, photography, original art, hand-turned wood, music, ceramics and much more. There’s shopping, stage and strolling entertainment, plusfestival food all for the price of one ticket. Get your hand stamped to return as many times as you want without paying again. There’s something for everyone in the family, including Kidzones with craft activities for the little ones in most venues. Adults, $7, Seniors, $7, Children $4. Click here for ticket purchase.